Showing an improvised melodica part to an experimental work in progress titled ‘stretch’. About the work: Five stereo sound recordings (of around ten seconds to two minutes duration) have been stretched to a duration of around 12 to 14 minutes; the digital audio workstation (DAW, in this case Reaper) maintains the pitch content of the original sounds, with some audible artefacts being introduced by the processing. The exact length chosen as the final duration for each of these five tracks was selected with some visual reference to their waveform displays in the DAW. Four of the five recordings were then pitch-shifted to roughly ‘tune’ them to the reference spectra of the first one recorded. 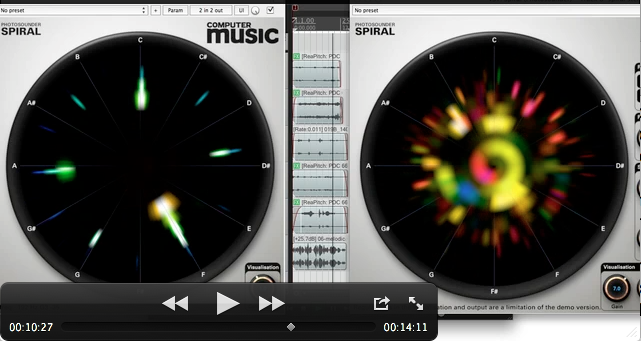 This tuning was done quickly and with little thought, the Photosounder Spiral plugin (as shown on the right in this video) was used to observe the spectra of the sounds during this activity. A melodica part was then recorded as an improvisation, performed whilst listening to the mix (on headphones) and watching the spectrum analysis which was interpreted as a real-time score of sorts, suggesting the notes that could be played. After being recorded the changing spectrum of the melodica improv was also observed, this time using the Photosounder SpiralCM plugin (seen on the left in the video). An offset of pitch (-16 cent) was applied to the melodica in order to better align the fundamental frequency of each note to 12TET (twelve-tone equal-temperament). Some artificial reverb was also applied to the melodica recording, in lieu of the artefacts introduced by the extreme time-stretching on the other parts.